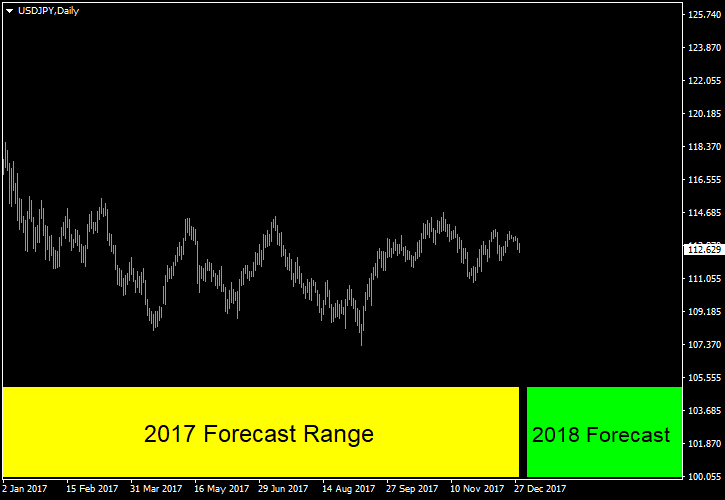 There is no trading on the final day of 2017, which offers a perfect opportunity to prepare a long-term forecast for the markets in 2018. 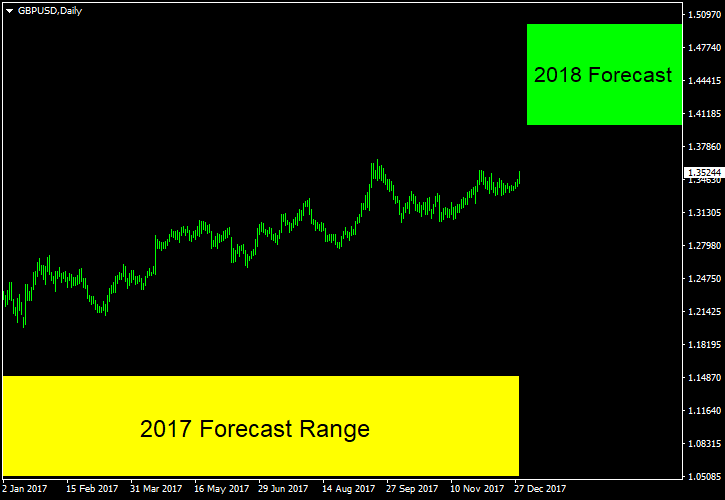 I will also review my forecast for 2017 to see where and why I have failed and where I succeeded in my last attempt to predict the year-end prices and rates. This year, I am moving the interest rates section above the main Forex forecast because my currency rates forecasts are based mostly on my expectations regarding the central banks’ monetary policy. Federal Reserve — my forecast of a 1.25%-1.50% range for the end of 2017 fed funds rate was spot-on thanks to relying on the Fed’s own median projections. For 2018, I turn my eyes to the most probable year-end outcome according to the Fed Fund futures pricing according to the CME FedWatch Tool — 1.75%-2.00% or just two rate increases for the year. This seems plausible, considering a rather low level of inflation, which will be further restrained by the rate raises passed in 2017. European Central Bank — another spot-on forecast from me. Of course, it was a very easy one. Everyone was predicting no interest rate changes for the eurozone in 2017. Similarly for 2018, I continue to expect no changes to the ECB interest rate with a high probability of them stopping the quantitative easing program. Bank of England — instead of cutting the rate once, the UK’s central bank raised it once in 2017. For 2018, I expect that BoE will have to raise the interest rates at least four times (to 1.50%) to tackle a rising trend in consumer inflation. Bank of Japan — as I anticipated, BoJ did not change the interest rate in 2017. The current situation with Japan is quite similar that with the eurozone. So for 2018, I expect no changes again. Bank of Canada — my 2017 forecast was quite accurate — 0.75%-1.00% prediction vs. 1.00% reality. I forecast that in 2018, Canadian policy makers will have to follow the way much similar to that of its southern neighbor (the USA). This means 1.50% rate by the end of the year. Reserve Bank of Australia — my forecast rate hike did not happen in 2017 as the Australian central bank decided to stay on the sidelines. With the country’s inflation being well below the official target range, I expect that RBA will have to stay put in 2018 too. Reserve Bank of New Zealand — another lucky guess for 2017 — the interest rate remained at 1.75%. New Zealand’s inflation is still in the lower half of the central bank’s target range, but is in an uptrend compared to its 2016 values. This consideration makes me believe that there will be at least one hike by the RBNZ in 2018 with the year-end level of 2.00%. Swiss National Bank — with a negative interest rate range between -1.25% and -0.25% and no change to it since 2015, it was not difficult to predict another year of stability for 2017. Even though there is an uptick in the SNB Core inflation, I doubt that it will warrant raising the rates in 2018, so I still expect no changes in the Swiss interest rates by the end of the year. The year has turned out to be stellar for EUR/USD. The currency pair experienced a strong rally and outright dumped my forecast (0.9500–1.0000 range). With most traders expecting as many as four rate increases by the US Fed in 2018, I believe that there will be a huge bearish surprise for those betting on the US dollar (see my interest rates forecast above). And with ECB stopping its quantitative easing program that year, the cards will be stacked against the greenback in the EUR/USD pair. The year-end range of 1.2000–1.3000 is wide but seems a viable forecast for 2018. GBP/USD too fared well in 2017. Despite the Brexit talks being a complete disaster, pound was steadily gaining versus the USD, leaving my forecast year-end target of 1.0500–1.1500 behind. I believe that the high inflation rate in the United Kingdom and no actual legal consequences from the Brexit will drive the pound up against the US dollar in 2018. The year-end range of 1.4000–1.5000 looks like a good bet to me. Although the first half of 2017 was quite bearish for the Japanese yen, USD/JPY failed to reach my forecast range of 100.00–105.00 due to an evident reluctance to fall below its September 8 low of 107.31. If the Bank of Japan does not introduce any new currency-weakening policies in 2018 (and I do not expect it to), there will be a minor growth of yen against the US currency. 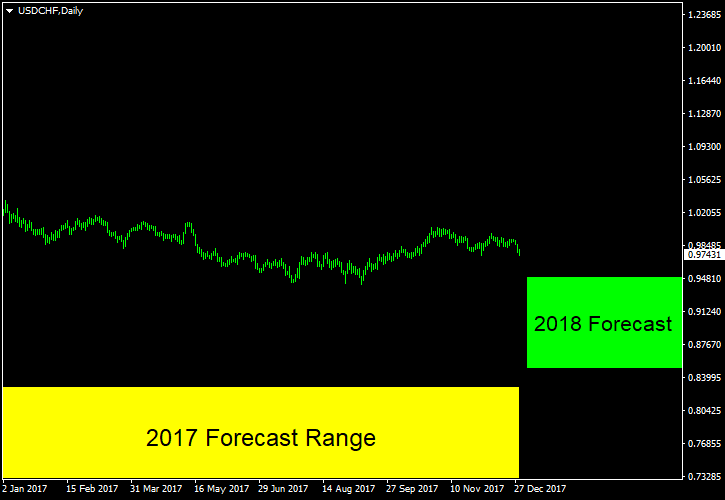 My forecast for USD/JPY is 100.00–105.00 — same as my 2017 forecast. USD/CAD is the only currency pair that is ending the year 2017 almost between my forecast levels (1.2000–1.2500). Moreover, it even traded within that range during September-October. I believe that in 2018, the Canadian interest rates will rise above the median expectations by market participants while the US ones will underperform. This will lead to the loonie’s strengthening with USD/CAD trading between 1.1750 and 1.2250 by the year’s end. I expected a strong rally from the Swiss franc in 2017. Unfortunately, it failed to deliver. Although USD/CHF is overall down for the year, it trades well above my crazy forecast range of 0.7300–0.8300. Even though the current inflation rate in Switzerland is very low and significantly below the target level, I believe that its rising trend will spur demand for the Swiss franc despite the unmoving interest rates. This will lead to a decline in USD/CHF to the range of 0.8500–0.9500 by the end of 2018. 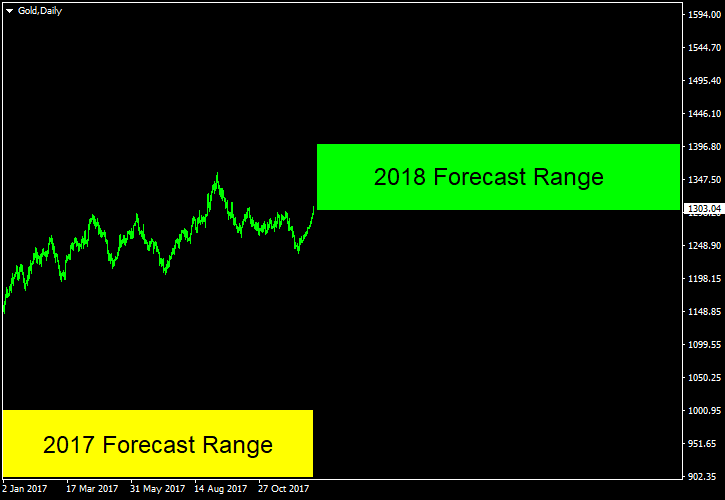 I did not make any forecast for the Australian dollar last year. This time, I will make an attempt with a range of 0.8000–0.8500, which means just a moderate growth of AUD/USD in 2018. 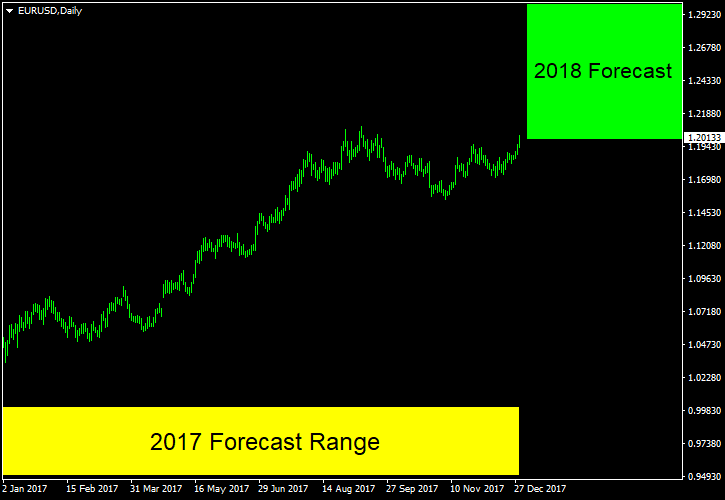 Contrary to my last year’s forecast, the price for gold spent the entire 2017 in a nearly perfect example of an uptrend, leaving my bearish forecast range of $900-$1,000 per ounce far behind. Unlike currencies, it is almost impossible to base the commodity forecast off the interest rate expectations. However, with gold it can be done — although US interest rates will be increased further in 2018, the current price for gold assumes a much more aggressive policy tightening. As market participants will start seeing slower fed funds rate lift-off, gold will start rising. My year-end forecast range is $1,300-$1,400 per troy ounce for the precious metal. 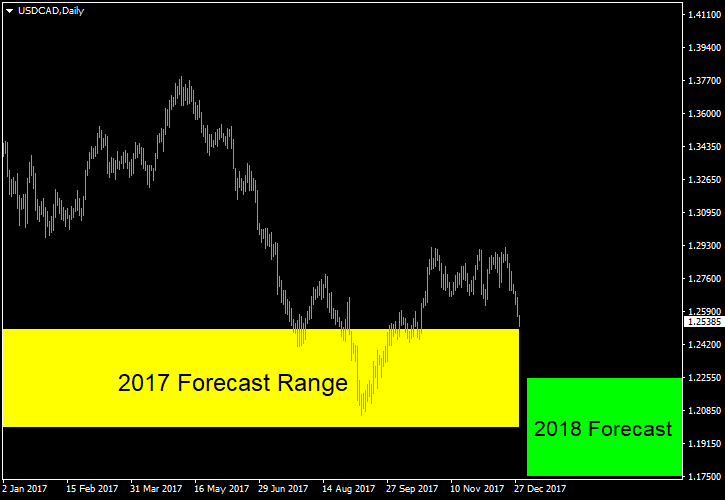 Thanks to the final two trading sessions of the year, the commodity has finished the year just above the lower border of my forecast range ($60-$80 per barrel), making it the only accurate prediction that I have made for 2017. Oil seems to be enjoying the OPEC production cut deal. 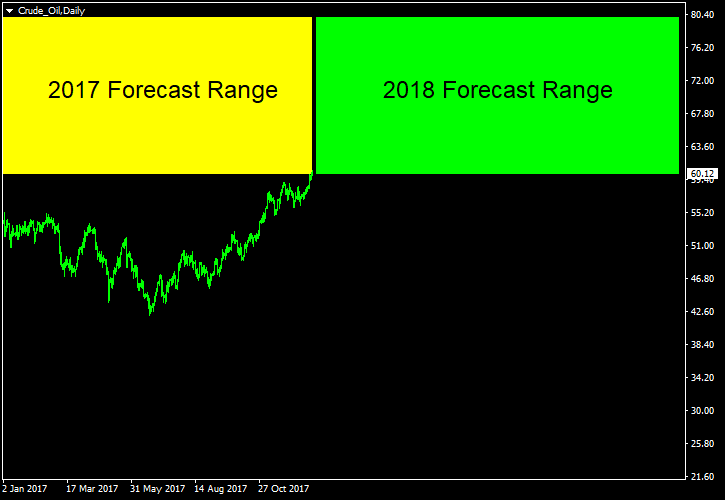 I believe that in 2018, it will help to stabilize the price in the $60-$80 range, which means that my forecast remains the same as for 2017. Update 2017-01-02: I have placed live money trades based on this forecast to put some real weight behind my words. 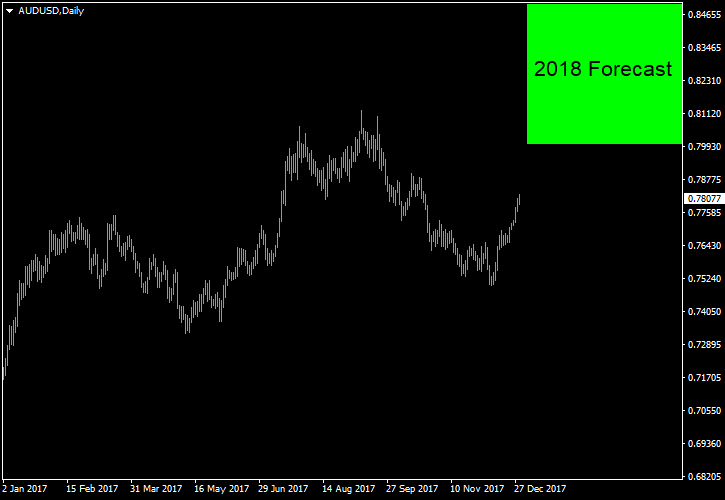 If you want to share your own forecast on Forex or the related markets for 2018, please feel free to reply using the form below. Thanks. Helpful information and good forecasts but I would not be so sure about rise in interest rates in Canada. As for me they will provide another way, against the USA. I do not see any high reasons for increasing of interest rates in Canada. I predict some drop to 1.21 and then rising to the current price area.